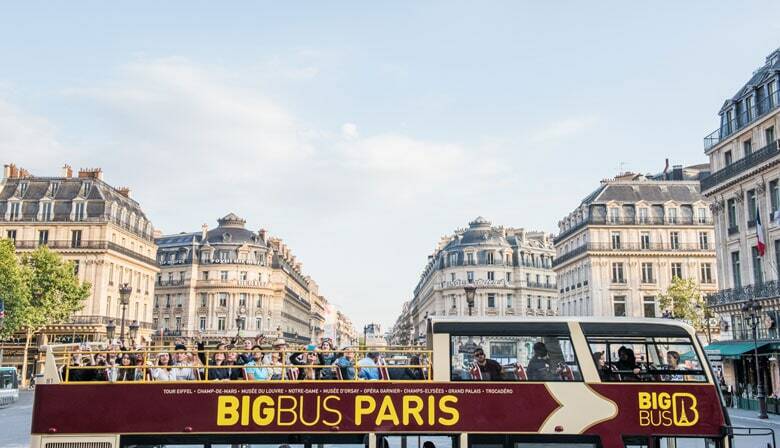 Take advantage of this pass to visit Paris aboard a double-decker Big Bus. Hop on and off whenever you wish at any of our stops located throughout Paris and enjoy the total freedom of discovering the city at your own pace. Big Bus Tours offers two sightseeing routes in the French capital, enabling you to see the most important neighborhoods and landmarks of Paris. You can start your tour at any of the stops by presenting your printed or mobile e-ticket to the driver. You'll listen to an audio commentary in the language of your choice on personal headphones.Throughout his tour, you'll hear the history and detailed descriptions of different Parisian sites as they appear before your very eyes. On your journey you'll be sure to recognize famous landmarks like the Eiffel Tower, L'Opéra Garnier, Notre-Dame de Paris, the Musée d'Orsay or the Champs Elysées. Geolocation app for real-time bus tracking based on your location. Discover the history of Paris with audio commentary offered in the language of your choice. Buses very regular! Bus drivers all really kind and helpful!